Burn video to DVD/Blu-ray disc/folder/ISO. Burnova is compatible with almost all video formats for dvd/blu-ray making. 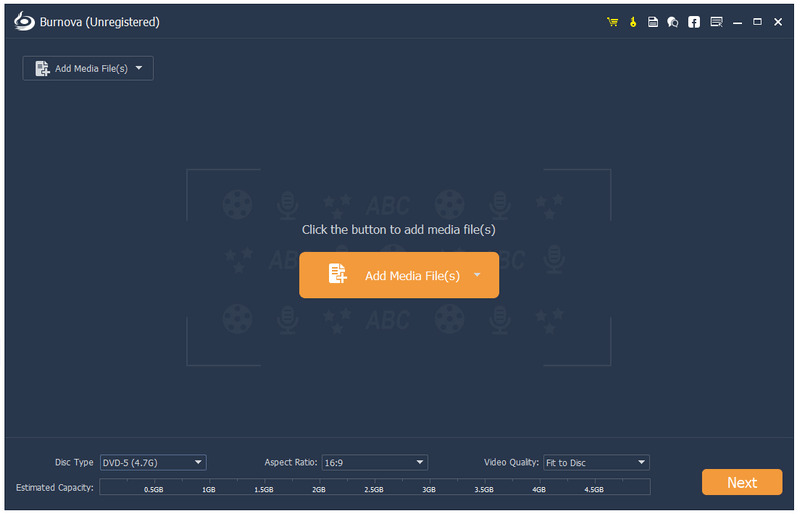 You are able to import video from mp4, avi, wmv, mkv, m4v, mov, m2ts/mts, 3gp, vob, flv, mpeg, mpg, dv, rmvb, tod, asf, etc. , even hd mpeg2, hd mpeg4, hd wmv, hd ts, hd mts, hd trp, and hd tp video files. It lets you add external audio track from mp3, aac, aiff, flac, wav, wma, ogg, ac3, mpa, mp2, etc. To make your own video. Burnova is an audio utility that works under windows xp, windows vista and windows 7. It supports both 32-bit & 64-bit windows editions, therefore it could run faster on 64-bit computers. Estimated download time for Burnova on a common adsl connection is less than a minute. Version 1.3.50 is brand new and was released fifteen days ago by Aiseesoft Studio. Click the green download button to download it now.